Earlier this year, I started to have a ponder around the idea of a Yahoo Pipes Documentation Project (the code appears to have rotted unfortunately; I think I need to put a proper JSON parser in place:-(, which would at least display a textual description of a pipe based on the JSON representation of it that you can access via the Pipes environment. Around the same time, I floated an idea for a code generator, that would take the JSON description of a pipe and generate Python or PHP code capable of achieving a similar function to the Pipe from the JSON description of it. Tony, very cool, I like it. :) I especially like the idea of giving people an “upgrade path” when pipes can’t cut it anymore. That was one of the biggest limitations I saw with pipes from the beginning, makes easy stuff easy, hard stuff impossible. This gives people a way to get to the hard stuff. 1) one advantage of the pipes2py approach is that is gets the output of a pipe into a py environment natively. What missing is a way (or even just an example) for a compiled pipe to consume a json object that already exists in py, maybe by passing it as an arg into a pipe_ function? 2) one of the complaints i’ve heard devs make about pipes is that you canlt include arbitrary functions. pipes2py natively emits json like objects; point 1 above suggests how it might make sense to allow a compiled pipe to consume json that already exists in the py envt. So what’s missing? b) how might we insert an arbirtrary python function into the middle of a compiled pipe ie insert additional functionality within a pipe? On a completely separate tangent, I get the feeling that jquery operates on a pipeline model, How far is the approach you took with pipes2py from something along the lines of jquery_pipes? 1) host a version of pipe2py and allow users to pass a Yahoo Pipes ID to it and get the compiled code back. If this was done on Google APp engine, could maybe also let users create their own directory of compiled code clips? 2) provide and ability to generate a python version of a pipe on Google App Engine using pipe2py /and then run that code on Google App Engine. This means Yahoo Pipes could be used as a GUI, and a compiled version generated and then run on Google App Engine (and/or the code exported and run on an arbitrary server as pipe2py code. This is totally awesome, as are Tony Hirst’s suggestions in comments above. 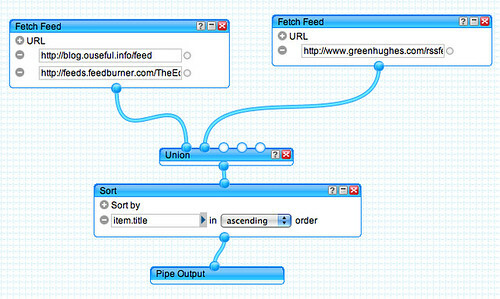 In this way, Yahoo Pipes can be the gateway drug to more robust coding/apps/tools. How could YQL fit in to this? Great discussion on Pipes alternatives! Recently I’ve been playing with feed parsing in Erlang and eventually I developed small mashup engine for feed filtering. Basically, I prototyped back-end logic for feed remixing end web front-end with small query language for pipes descriptions. More here http://klemo.posterous.com/erl-metafeed-feed-mashup-engine. Project is still just a prototype, but I am planning deployment on public server for testing soon.